I was in the mood for Japanese cuisine and it’s been a while since I’ve made sushi rolls. They really are not that hard to make and you can put whatever you want inside. 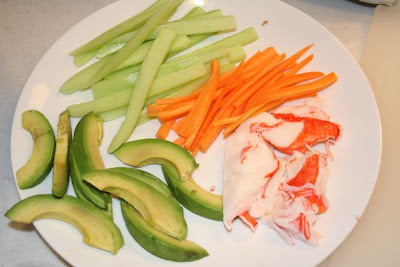 These are stuffed with crab, avocado, carrots and cucmbers. 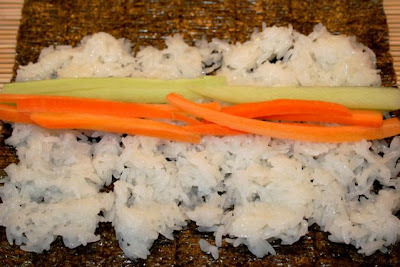 Of course the most important aspect of sushi is the rice. Unfortunately I didn’t have a great sushi rice on hand but at least I had a sticky shorter grain rice. Actually it was too sticky and became a bit gelatinous, but it was ok. Sushi rice preparation is something that is almost an art in Japan. 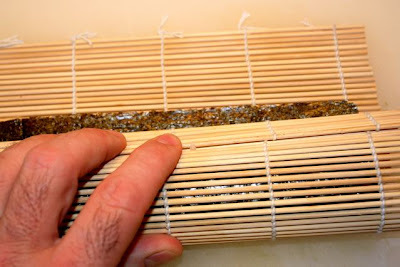 Right out of the steamer, while still hot, the rice is seasoned with rice vinegar usually sweetened with some sugar. The rice is traditionally cooled by fanning by hand. 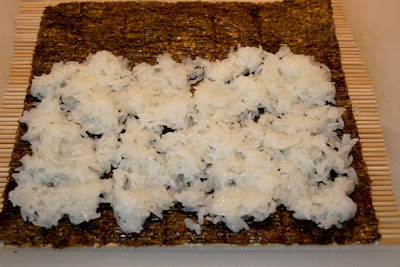 I like to lay out a thin layer of rice about 3/4 of the way up a sheet of nori. It helps of you wet your hands with some water to prevent the rice from sticking. Simply lay your ingredients in the middle of the rice. Here are the cucumbers and carrots. 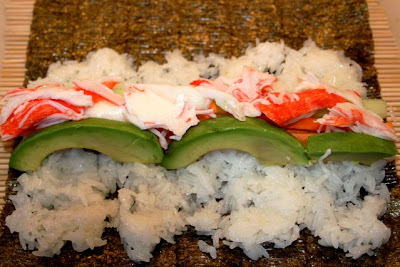 Next, the avocado and crab. 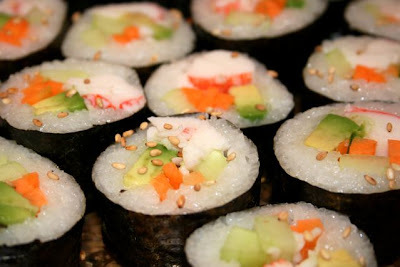 Real sushi chefs can roll these by hand without the aid of a rolling mat, but mine turn out best if I use a mat. 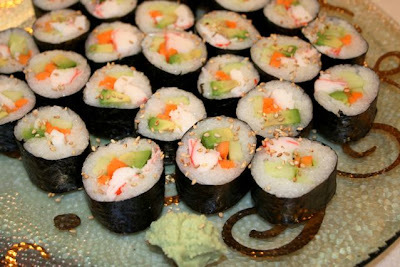 The idea is to roll the sushi pulling it in tight to make a firm roll. The edge is sealed by wetting with a little bit of water. 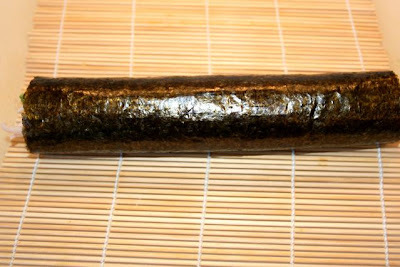 Here is the roll all ready to be sliced. You can slice them however thick you want them. I like a pretty good mouthful myself. Along with the sushi I made an Asian-inspired soup. 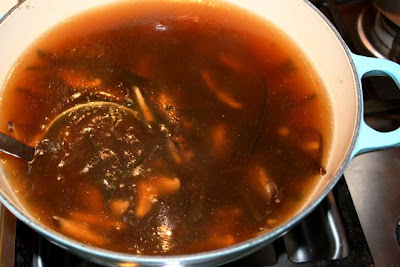 I started with a stock pot filled with kombu (seaweed), dried shitake mushrooms, garlic and ginger. This was simmered for about an hour until the mushrooms and seaweed were tender and the broth was flavored. 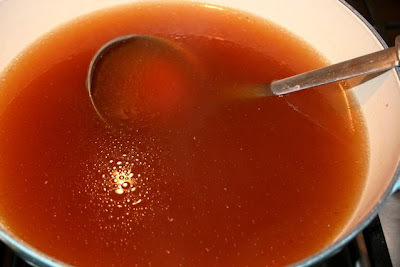 The broth was strained and flavored with some soy sauce, clam dashi powder, a splash of mirin and a dash of sesame oil. 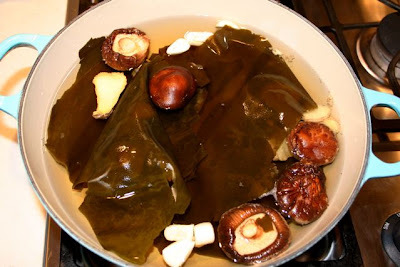 The mushrooms and seaweed were sliced finely and placed back in the soup. Served with soy sauce and wasabi, the sushi was really tasty. 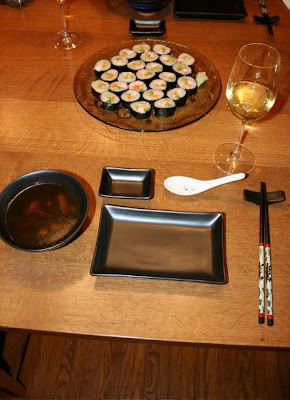 The soup was very satisfying with a full robust flavor yet lightness that went well with the delicate flavors of the sushi. I’ve been traveling quite a bit lately. I plan to share with you all food from my camping trip through Yellowstone and the Black Hills but I am still trying to organize all my photos. Stay tuned for that. But I did want to update my blog to let you all know I am still here and still cooking. Let me share with you last night’s chicken dinner. 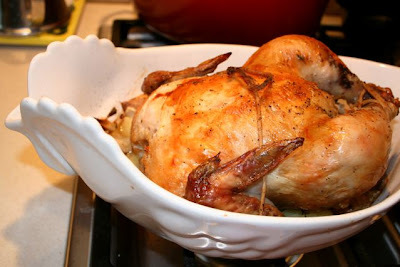 Simply roasted chicken is just such a delight for a hearty fulfilling Sunday meal. This chicken was stuffed with fresh sage, thyme and winter savory. It was brushed with butter and sprinkled with salt and pepper. Underneath is a bed of potatoes and onions seasoned with the same herbs. I like to roast my chicken at a high heat at first. First, the chicken was placed breast down and roasted for 20 minutes at 500 °F. It was flipped over and roasted for another 15 minutes at that high temperature then I turned the oven down to about 375 to finish roasting. I cook it just until the thickest part of the thigh hits 160 °F. Then I take it out, cover it with foil and let it rest for at least 10 minutes before cutting. This allows the juices to set back in the meat and it will finish cooking. I just found some new plates at TJ Max that I thought were perfect for serving this Sunday chicken on. They were only $4. Quite a deal if you ask me. The interesting white plate was on clearance for $5. I love the four individual serving wells on this one. 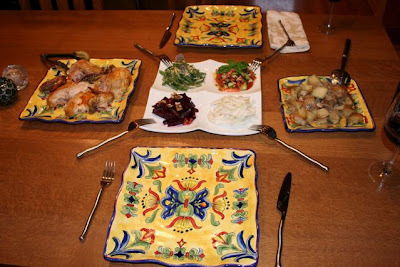 Actually this plate inspired me to prepare four salads to go along with the meal. One was super easy. I simply sliced up some fresh kohlrabi from the garden. Nothing else was added to that one. I love the fresh crunch of kohlrabi. I’m a big fan of broccoli stalks and I think this vegetable tastes just like it. I had some roasted beets in the fridge from a few days ago so I made a beet salad with a pinch of brown sugar, rice vinegar and walnuts. Sweet and salty complimented the beets well. I also had some fresh green beans in the garden. I quickly flash steamed them just for a minute to set the color but at the same time they were still crunchy. After chilling in ice water and drying they were mixed with slivered garlic, fresh oregano, dijon mustard, rice vinegar and salt and pepper. What to do with zucchini? 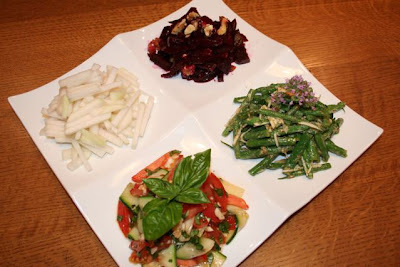 I made very thin shaved slices and wilted them by salting the zucchini and letting them drain. After rinsing and drying they were mixed with fresh basil, fresh tomato, fresh chopped garlic and olive oil. Refreshing and delicious. I really like the texture of the zucchini in this. The wilting gives it a slight ‘cooked’ texture and softens it but it still retains a lot of the flavor, only enhanced, of the raw zucchini. Nothing fancy here in terms of plating. 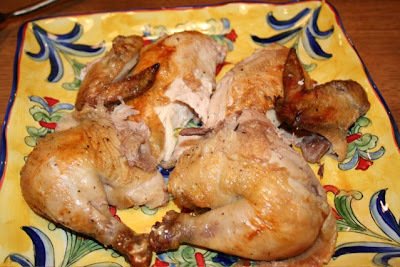 I cut off the wings, breast and leg quarters and just slapped them on a plate. 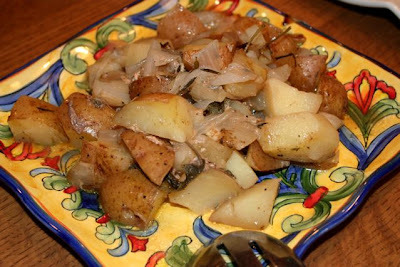 The potatoes and onions were flavored by all the chicken drippings. The flavor was unbelievable.